First sentence: Her name was Caitlin, she was eighteen, and her own heart would sometimes wake her—flying away in that dream-race where finish lines grew farther away, not nearer, where knees turned to taffy, or feet to stones. All I can say is, don’t start this one at night. Or if you need to sleep. You’ll want to keep turning the pages to find out how it all ends. Plus, there’s so much suspense you may not even be able to fall asleep. Caitlin and her brother, Sean go out for an early morning run in the mountains but only Sean returns. It’s a family’s worse nightmare. How do you stay together when the family is so violently fractured? How long do you keep looking and hoping? 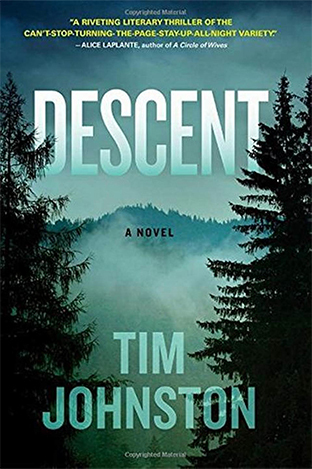 Johnston gets into the dark knotty places of a family in crisis. We are allowed deep into each person’s secrets that they guard close to their heart. Each one struggles in their own way to deal with this loss, striving to balance hope with pragmatism, letting go with moving on. Not only is this a thrilling suspense story/mystery, the writing is just, well, stunning. Whether he is describing the sun in the pines, the mountains or the relationships between the family and strangers, his language is lyrical and precise. They belly out over the bed, rippling, luffing—and abruptly empty again, and for a moment everything is still. He has a gift for creating the absolutely perfect verb in each and every sentence. I borrowed this one from the library but may have to buy it at some point so I can read it again slowly, with pen in hand. A sentence I love: The sunlit creases in the pines where some living thing might travel, bear or moose or hiker or daughter. 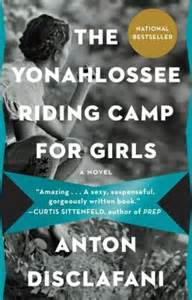 First sentence: I was fifteen years old when my parents sent me away to The Yonahlossee Riding Camp for Girls. Set in the beginning of the Depression, this novel is fraught with all kinds of tension: between families, between classes, the financial tension of the depression, the sexual tension that comes with being a teenage girl, the tension between a horse and its rider. Seriously, this story is steeped in tension and that is what kept me turning the pages. After her part in a mysterious family tragedy, Thea is exiled to a horse camp for girls high in the Blue Ridge mountains. Far from the home she loves and separated for the first time from her family, including her twin brother Sam, Thea must find her place in this new world as well as come to terms with what got her sent away in the first place. First sentence: She knows there is something wrong with the baby. So begins the new thriller, post apocalyptic story by Ben Percy. I was reeled into this dark, decimated, mutated world from the first sentence and hung on for the whole wild ride that included slavery, mutant creatures, the grappling for power and so much more. It’s one thing to have an intriguing premise. It’s another to populate the premise with deeply flawed yet beautiful characters in a deeply flawed yet beautiful world. 150 years ago the world suffered a massive flu pandemic followed by nuclear war that left the world unrecognizable. A small group of citizens in St. Louis built a wall around their city, calling it the Sanctuary. There they lived in a prison of their own making, keeping the world at bay. Then a stranger rides into their midst, declaring that there is life beyond the Sanctuary—a life that that includes fresh water (which is very short supply within the walls of the Sanctuary). Do they trust her? Do they leave the safety of their own walls to explore what may lie beyond them? 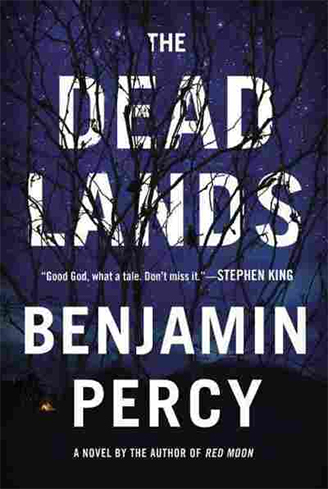 “The Dead Lands” weavess together all of the dangers we face as a society, as a world: flu pandemics, nuclear war and fallout, climate change, water shortages. • The night is wrapped in many sheets of silence. • Life might be a catastrophe, but it is a beautiful catastrophe.